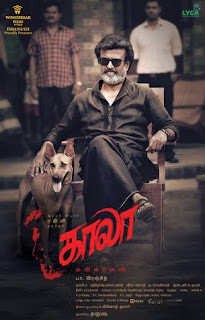 By titling the movie Kaala after KaraiKaalan a Tamil name and also the protagonist name - the movie sets up the metaphor in many ways. KaraiKaalan ( Rajnikanth) wears black for most of the movie and says in a dialogue - Black being the colour of the workers and white being the colour of the rich worn by the politician Abhyankar ( Nana Patekar ). Black can be the racial reference to the Tamils in Dharavi . It can be the squalor of the slums that no one wants to see but everyone wants to use. Now PA Ranjith could have stopped here. He cant because he wants more ideological wars. He inserts Bhim Rao Ambedkar in all the background images. One son is named Beemji. He adds a tiger to the Abhyankars party symbol making it look like the Shiv Sena. Interestingly Shiv Sena won Dharavi by putting a Tamil candidate in 2017 ( http://www.dnaindia.com/india/report-bmc-elections-2017-shiv-sena-secures-dharavi-by-changing-strategy-2333200) . As if this was not enough, the climax of the movie also has a Ram vs Ravana metaphor when there is a puja in Abhyankars house but he is going on a killing spree and naming kaala as a Ravan. Then there is a cringeworthy grand daughter scene trying a Nayakan type ' he is a nice guy, dont kill him' nallavara /kattavara homage. This kind of baggage is unnecessary in a Rajni movie. Rajni as a superstar is above caste, creed, religion, countries. If he is oppressed , it doesnt matter who the villain is, we just want him to take revenge either lawfully or with sufficient creative liberty. Who cares for PA Ranjiths class conflict problems. The movie has its best moments when it is not about the extremely over metaphorized class conflict. Rajnikanths moments with his wife ( extremely well played by Easwari) again shows you dont need a young heroine, you just need genuine emotions. As a couple who have lived through thick and thin, this depiction is mature, deep and yet has the moments of everyday couple banter ( watch out for the scene where Easwari speaks English or worries about his ex-love). The ex-lover track - Zarina played by Huma Qureshi, is first shown in animation to prevent embarassing the aging star . This makes for good viewing especially when Rajni tries to hide the tatoo of her name and still meets her separately and she calls her Karaikaalan when the locals call him Kaala seth. The every day ness of the settings, how the family stays together against adversity actually is well portrayed. A good track is one of the sons Lenin opting to leave the house to pursue his initiative of building a housing complex. As a family drama and Kaala as a family man leaning on his eldest son to protect him, the movie has its best moments. But that doesnt make it a superstar movie. Zarina is a very poorly sketched out character - returning from Africa to do social service in her hometown of Dharavi, she is shown as neither courageous nor deep. Samuthrikarni as Kaalas sidekick is lively but was probably not necessary. 1. Will Dharavi come alive ? - This is where the movie actually does better than expected. Having crossed Dharavi so many times by road , the settings are very real. I could say - hey this turn and you get into Dharavi. You feel you are inside Dharavi as the movie progresses. You can see the bridge that connects the slums. Instead of starting with animation of the land, I felt a tour of Dharavi could have been better. The most real part here is the Marathi girl (Kuyal) played by Anjali Patil, s her strife as a firebrand activist trying to improve Dharavi comes out the strongest.. She speaks Tamil and stays in the chawl part of Dharavi showing a divide within a divide. When she gets molested by the police, you feel the most. I found the language also good - there is a mix of Hindi / Marathi words in the Tamil spoken by Kaalas family - e.g. Summa MachMach Panninda. While you can have some characters speak Tamil even if they are not Tamilians, the movie has made Nana Patekar, Pankaj Tripathi( completely wasted as a police inspector Patil - he is too UP for a Marathi inspector who speaks Tamil ) all dub their dialogues in Tamil. I somehow felt this movie could be bilingual. A Marathi inspector saying 'Chayla' would add more realism. Same for Nana Patekar. What you get is a very muted Patekar. Will the conflict of Rajni- Nana bring the house down? Will there be sufficient intrigue and layers in this conflict or a simplistic view of a politician who wants to access that land under Kaalas control - a conflict seen many times on screen. This is the movies weakest link. There is only one scene where Nana Patekar gets trapped in Dharavi where the conflict really sparkles. By the end its a damp squib. There is an obsesssion for Nana to make Kaala fall on his feet. He could have made life difficult in many other ways. 3. Anguish - Not so much as what you saw in Nayagan. Here because the back story ( Rise of Kaala) is shown in animation, you dont care as much. It is even weaker than Kabali - where the anguish of losing out to the Chinese and degradation of Malaysian Tamils to petty thieves was well depicted. Not having enough of 3, and PA Ranjiths deliberate attempt to show that the Superstar is aging gives the movie a double whammy. You have an entry scene where the superstar while playing with some kids gets clean bowled. You have a punch dialogue scene 'Kya Re Setting Aa' called out by the Superstar only to have the son hitting the villain ( Spoiler Alert). The Superstar is in fine form. Right from his lionish mane and stylish mannerisms , he even aces the emotional scenes. There is also a comic drunken act as well thrown in. 1. Even a kid knows he is Superstar - so he is universal, beyond class, creed etc. You dont need backdrops , he is the backdrop , prop, and propeller. 2. Make Up-a Aethunga, Get Up-a Maathunga, Set Up-a Maathaadeenga. ( Increase the make up, change the get up but dont change the set up) . Dont change the template - its fine- Superstar can provide the romance, comedy, emotions and that punch . A superstar movie is nothing but a complete entertainer with specific scenes that accentuate Superstars sheer prowess. Making an entertainer is the first step. 3.Unga Paera Orudaram Sonna, nimindu Ezhundhidum Pullum ( Even if you say Superstars name even grass will stand up) - This is that X factor - the punch dialogue , that Laka Laka , that glass without the frame in Baasha, that movie magic that is inimitable by anyone else but Rajni.